Party Bus Group was founded in and called Long Beach home for the last 4 years and it is one of our favorite areas whether you are talking downtown, the marina or 2nd Street. You can count on us for all of your nightclub, brewery and event tours! 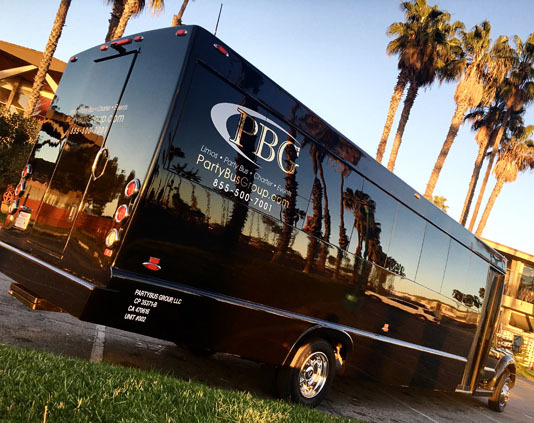 PBG offers small, medium and large party buses in Long Beach, CA and the area at the most competitive rates. No other service has a better reputation than us. Take a look at our reviews on profiles like Yelp, Thumbtack or top wedding sites like The Knot. WHY BOOK YOUR PARTY BUS IN LONG BEACH WITH US? Designated driver: You don’t have to worry about traffic, parking, or anything else. Sit back and sip a cocktail or two while we handle the hard stuff. Take all your friends along: with buses that can accommodate up to 50 people, there’s no need to leave anyone behind. Convenience: Our party bus will pick you up anywhere in Long Beach or the surrounding area and at the end of the event we’ll drop you off right at your door. We can also help with your Los Angeles party bus rental as well. It’s easy to rent with us, you can simply visit our website or give us a call on 855.500.7001. As we said, LB is our home turf. There are tons of things to do and plenty of reasons to do them in a party bus or one of our sprinters. It offers great nightlife with the bars and pubs on 2nd Street, Broadway and Downtown. Not to mention Ballast Point has their amazing brewery right on the water. What would you expect from the second largest city in Los Angeles? It’s also home to some main attractions like the Aquarium of the Pacific and the Queen Mary. Those you can visit year round. This coastal city also hosts the Long Beach Grand Prix. So if you are looking to hop on a brewery tour, plan a corporate event or just enjoy a night out without worrying about who’s driving, get in touch with Long Beach’s local party bus company. If you are looking to have a great time, no other Long Beach party bus rental company knows the local area better than we do. Our fully loaded vehicles come with luxurious wrap around leather seating, prime sound systems, state of the art lighting, flat screen TV’s, multiple bar areas and even bathrooms on our bigger buses! My daughter wanted a party bus to celebrate her 16th birthday with 15 friends. They had a great time. The bus was clean, the lighting was definitely party vibe, and the sound system was on point The Party Bus group was easy to work with, good communication and our driver was very professional.